An awesome place to come and relax with friends. Coffee house style, bring your own food. Plenty of seating options including couches. Several board game options. Great beer list with many unique types on tap. I like that they not only tell the style of beer, but the ingredients used (simco hops for example) There is always something different on tap, and a good range of light to fruity to dark. The suggestion of the bartender concerning the nearby deli should be heeded! Didn't have time to sit and drink, but I was able to run in and pick up a growler. It's a bar with no food. Nice looking bar if you can find it! Back in an alley that they call the Traverse City Warehouse District (the bartender described it more accurately as the Warehouse Road). Even standing in front of the place, I wasn't sure if I was in the right spot. Got some of the Black (Eye) PA - a black IPA. It was good, but too much roast in the nose and taste. Lots of interesting brews on tap, but I didn't have time to try anything else. Wish I had more time - would have been great to get sampler and try the bourbon stout, chai pale ale, or triple chocolate stout. This is the third one in Traverse City. It was my favorite in Traverse City. The beers are really creative, hence the name of the brewery. It was $15 for a sampler. The beers had much flavor and body. My favorites were a bourbon stout, and a rye IPA. The others were very good but, it would be hard to drink a pint of them. There was a cherry ale, a basil ale. They were good for a few gulps, but after that it gets a little too much. All in all, this one is definitely worth visiting. I wish I could had seen the brewery though. 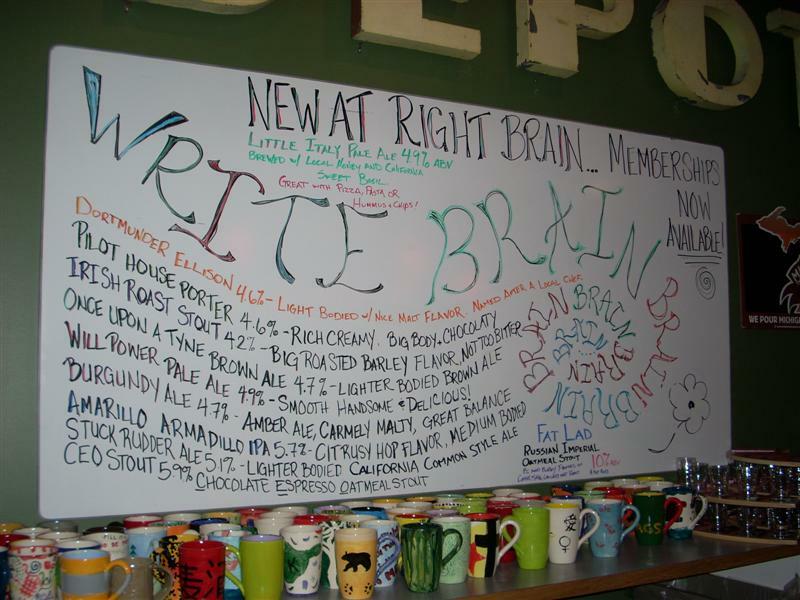 We visited Right Brain October 2008 on a long Traverse weekend. We had heard a lot about it, with many people saying how they love the beer as well as the atmosphere. The room had unpainted cement floors with stiff bar stools, and everything seemed cold in more ways than one. I never took my coat off, and at 43 years old I felt like I was too old to be there. Everyone else looked collage age. There is a hair salon next door, and although it was closed when we were there I guess you can watch people get their hair cut while drinking beer. Still can't wrap my head around why that might be entertaining, but to each their own. We tried the sampler and my favorite was a fruity wheat beer, which is not usually my top choice. My husband liked the IPA, which is usually his top choice. None of the beers I would rate as "excellent", and try as I might I couldn't put a finger on why that was. I wonder now if they use a different style of yeast than most breweries. They did have a lot of beers available, and it was difficult to decide which ones to sample. I'll try them again the next time we vacay in Traverse Bay area. As a frequent visitor to TC I was pleased to see another brewery open here. As with the other review it is a strange place. Kind of like a local coffee shop but with beer if that makes sense? Beer are usual style with a few odd balls thrown in. I do like there wheat beer it is nice and tru to the style. Last winter had a stout that was delicious but do not recall the name. Also they have a cream ale brewed with wasabi?? haven't been up there to try yet. 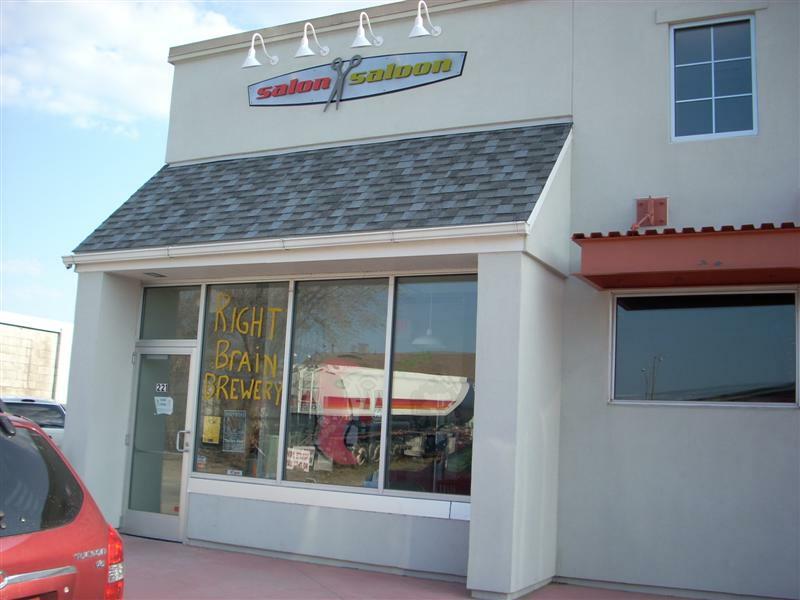 Bar tenders have been knowledgeable about there beers and gave good service. I was able to sample a few types(small samples)without paying which is always nice. My wife and I have hung out and played darts and had a few pints... Again a little different but worth a stop. They do have snacks available from local merchants which is nice but no food to order. Seems like more snacks were available to buy this time around too more shirts and other swag for sale too... Always worth a stop to see whats on tap! I tried their sampler this past weekend (06/07/08). Overall, the six brews I tried had great smoothness. The brewery itself had an awkward feel to it. It seemed like some guys basement, who couldn't decide between artsy and country saloon. One the beer list, they brag about having some many brew, but not enough beer taps. However, they only had 8 beers on their list, and it appeared twice that many taps. Their sampler was a little more pricey than most places in the area, but large samples (6oz), and they were clear about you choosing all six. Smoked Ale - Definitely one of my favorite, not an over powering smoky flavor, very smooth. Casked IPA (served warm) - Good feel and flavor, not as much hops as I like in IPA, but I did enjoy it. Belgium - This was the only one I was not a fan of. Though I typically do not like Belgiums I always try them to see if I can find one that will change my mind. Even others I was with turned this sample away, I don't think anyone finished this one. Honey and Basil Ale - Had to try this because it sounded interesting, and interesting it was. 6oz is good enough for this one. The honey is well noted and smooth, the basil comes and goes on the palate. At some points it is enjoyable with the licorice type flavors, but at other points it taste like an Italian dish. Porter - By far my favorite, very smooth and delicious. Not too sweet or over powering flavors. My one beef with this is that it states that this beer's head "is known for putting Guisness to shame." Now that is a tall claim, especially when my head was completely gone after 10 minutes without taking a drink. Imperial Oatmeal Stout - Not bad, but kind of a disappointment. I was looking forward to this one. Tasted a lot thinner, even for an imperial at 10%ABV. The coffee flavors were a little too harsh.